Burbank, CA July 19, 2018 – JohnHart Real Estate has done it again! The Los Angeles based company unveiled plans for a pilot program that offers Concierge Services for current agents, incoming agents and future agents joining the JohnHart Team at no charge. The company was created on principles of being a full-service real estate brokerage and they continue to increase such benefits. JohnHart agents are assigned an agent liaison and army of in-house industry best professionals handling ALL aspects of their business; such as but not limited to: writing of contracts, transactions, scheduling, marketing, social media, web development, media and promotional assignments from conception to completion. Field technicians take care of the burdensome tasks such as photography, coordination and sign installation. With the implementation of the complimentary Concierge Program, JohnHart will now store, set up and pick up open house signs for their agents. “The consensus is; real estate agents dislike having to put out open house signs” says Harout Keuroghlian, Chief Executive Officer at JohnHart. “As long as hosting an open house continues to be an integral part of selling a home… signs need to be placed on multiple street corners guiding prospective buyers to the listing. JohnHart is proud to be the first brokerage to offer real estate agents a convenient and wonderful new way to make their lives easier. We will set-up signs a few hours prior to your open house, pick up signs at the conclusion, provide the maintenance and storage so that our agents will never need to deal with them again” continued Harout. With the introduction of the Concierge Van along with the newly formed Logistics Manager and Open House Coordinator positions, agents can wave goodbye to those headaches and hassle. Avoid damaging their vehicles by constantly moving signs in and out. Avoid hazardous parking situations and traffic, ugly weather, and most of all save valuable time and energy for themselves. Arrive at the property to see all your signs set up while easing your way into the day. Allow us to do the dirty work – work smarter, not harder. JohnHart thrives on taking away day to day tasks from their agents; giving them that peace of mind and extra time to concentrate on their listings and clients. 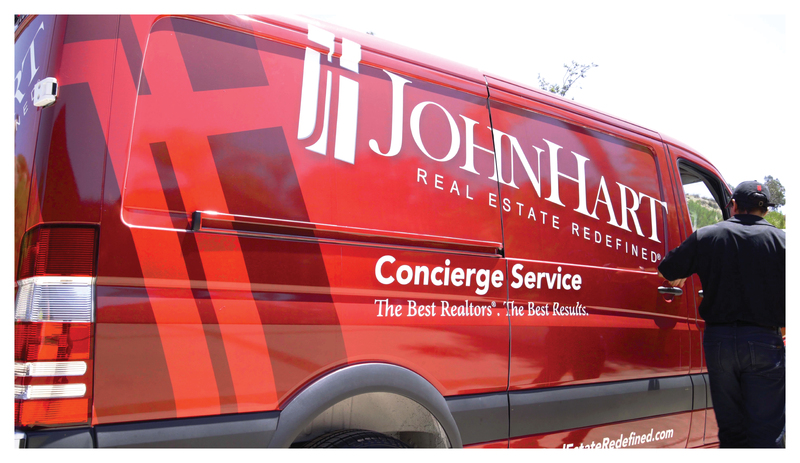 With over 300 agents and 9 offices spread across Southern California, JohnHart plans on adding a fleet of these Concierge Vans to keep up with their growth and expansion. Bigger Than ‘Bron: LA Is Divided, Can Lakers Unite? This is a great value to agents as no agents that I know want to put up, take down and store open house signs.Most agents really dread this task. When will this service be available to Santa Clarita? Such an Amazing Idea!!! Love It!!! Excited and can hardly wait to use the Service! As Always, Thank you JohnHart RE & Harout Keuroghlian, for everything you do for Us, to Enable Us to dedicate more time to Our Valuable Clients!! !